I never knew about my family connection to Edward Kennedy Duke Ellington until a visit in my late teens to my Uncle Mervin and Aunt Emma’s house in McLean, VA. My father just casually blurted out something about “well, ole Duke’s gone.” I can’t remember the exchange of words, but I remember a tone of something more on the level of familiarity than just fan fodder. 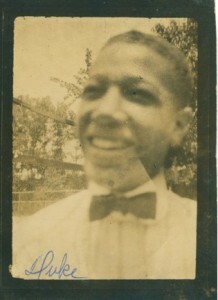 At the time I was also a student at the Duke Ellington School of the Arts. I wondered why this was kept under wraps for so long. It was even longer before photos emerged. Duke isn’t the only one gone since this photo emerged. Aunt Emma, Uncle Mervin, dad, even Undercover Black Man. No, the photo is not like the Hope Diamond. Much time passed as this story continues to unfold. A few weeks ago at the opening of the restored Howard Theatre Clayton LeBouef and I happened to run into Duke Ellington’s son Edward at Chix, a sustainable chicken and veggie joint (I mean that in the positive sense) in the U Street area. I happened to have a copy of one of my aunt’s pictures on me, just in case. I gave it to Edward. His sister April joined us in dining area not long after. Serendipity? Destiny? We discovered we all had family connections to one another that day. Ellington. Still universal. 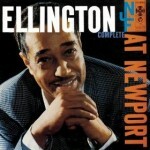 BTW – My favorite Ellington recording – “Live at Newport.” This was the band’s comeback performance at the Newport Jazz festival in 1956. It was assumed big band was dead. Not so fast. If you like it hot. This Ellington band performance is definitely on fire. After seeing this, buying that latte will have a whole new meaning. Gemal Woods sat down with Kenneth Ferdinand in New Orleans for an hour to record this interview about the first enterprising coffee maker, Rose Nicaud, an enslaved woman who sold her own roasted cafe noir and cafe au lait from a cart. Kenneth Ferdinand is co-owner of the Cafe Rose Nicaud at 632 Frenchman Street in NOLA. Oh, and BTW, that Gemal guy who created The Angle Show series recently won a LA Web Series Festival Award for best TRAVEL, TALK, LIFESTYLE, OR MUSIC SERIES. I actually went to the CVS today to buy some peeps to decorate the top of a coconut cake. But it looks like they’re all out and are probably sitting in these dioramas for the Washington Post annual Peep Show (VI). 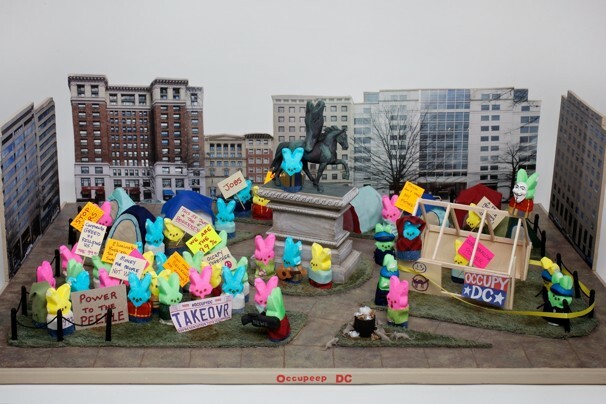 The winning diorama was “OccuPeep DC” by Cori Wright of Falls Church, VA. And the Post jumped right on the “Power to the Peeps” subject line. How could you resist. Click on HERE to go to the Peep Show slide show. I also enjoyed the “Peepville” a parody of the Facebook “Farmville.” The cake will just have to stand on its own. I was in NYC a few weeks ago, and there was definitely something in the March air. Children were playing on playgrounds, the hustle didn’t seem as brutal as it had been just before fall when I last showed up on the scene. However my last visit was the day before the Occupy protestors took to the park on Wall Street. After protestors were cleared out by police from Wall Street they took up a new occupancy in Union Square. It was only a few hours after I left the Union Square area the NYPD took charge again. The following evening it was the 1 million Hoodie march for Trayvon Martin. 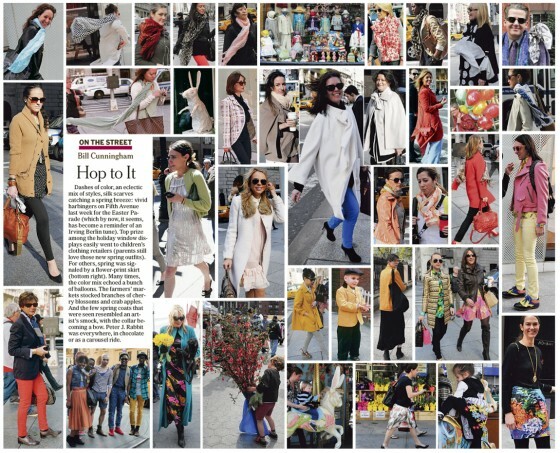 Seems like a good time for a Bill Cunningham distraction just for the sake of life balance. Today was opening day for the Howard Theatre. This was my first time ever in the space. The Howard closed before I was able to buy a ticket for a show. Some people have seen this movie before. 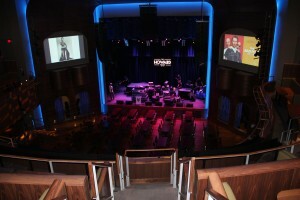 The historic venue had two re-openings in the past. The last hurrah may have been in 1980. The venue remained closed or more like in waiting until someone with the vision, connections, and financial backing could breath life back into it. Location made it a challenge. A subway helps. 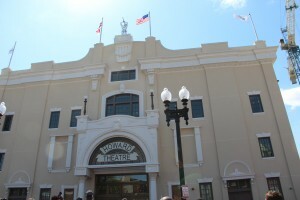 A combination of committed public and private efforts (Visit Howard Theatre Restoration – http://www.howardtheatre.org.) 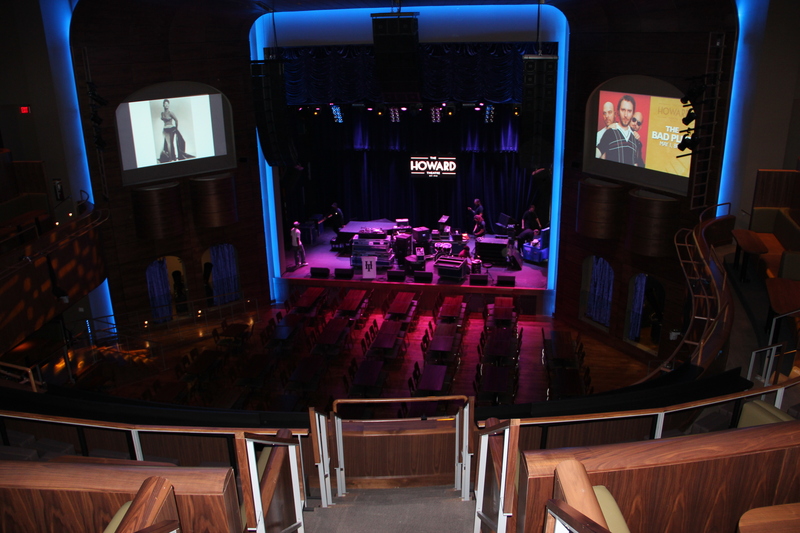 The Howard Theatre has a grand old history in Washington, D.C. Built in 1910 as one of the few if not first African American professional performance venues in the United States, it hosted vaudeville artists and minstrels, big band and jazz from native son Edward Kennedy Duke Ellington, Cab Calloway, Count Basie, Ella Fitzgerald, Billie Holiday, Sarah Vaughn, comedians, soul brother #1 James Brown, Otis Redding, the Supremes. In its hey day, the Howard wasn’t an audition venue for the big time. The Howard was the big time. 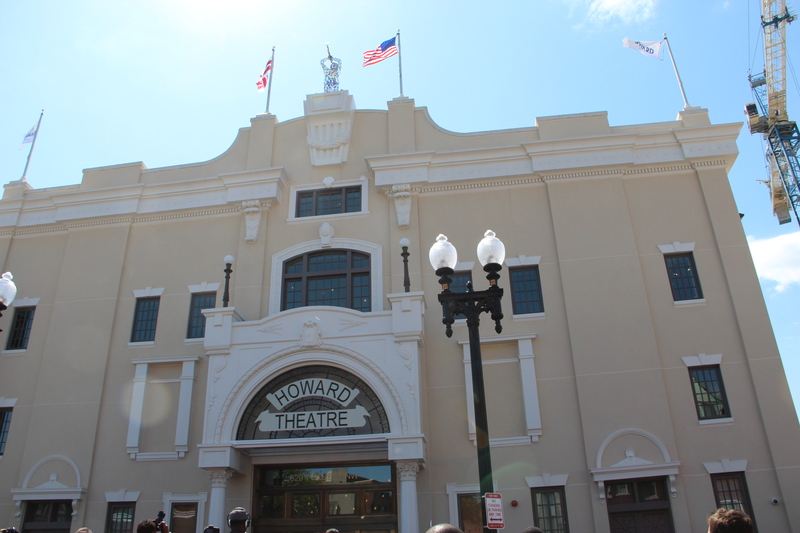 Before there was an Apollo, there was the Howard Theatre. It’s going to be an interesting reawakening for the Howard. There were lots of hopes waiting outside to see the new space. Hope to relive the sweetest memories of youth. Hope it will bring employment opportunities to residents. Hope it will never close its doors again. Hope that this will be more than a spring fling.